The latest USPS rate increase kicks in on Sunday, January 27th. For those of us who are shipping regularly, whether small business or moms selling outgrown clothing on Facebook, here is what you need to know and how you can ship most efficiently. How much is the USPS Rate Increase? Unfortunately the rate changes vary by product. In general, USPS rates are increasing between 5% and 10%. The BIGGEST CHANGE to USPS pricing is to the actual rate structure for First Class Packages (the most popular mailing option for many who sell online). Adopting the same logic as Priority Mail, 1st Class Package rates will now carry a distance component. You can still ship items up to 15.99 oz (including all packaging) using First Class Package Rates if you use PayPal or Pirate Ship (at the post office the rate is only available for up to 13 oz). This sounds complicated, but it’s really not. On average, the difference between the closest rate and furthest is about 50 cents. Whenever you send a package over 15.99 oz, you need to use Priority Mail. There are several Priority Mail options to consider and these rates can vary quite a bit depending on weight, size & distance. Personally, when shipping Priority, I almost always use Pirate Ship. For one, they have an easy calculator that tells me the best rate based on dimensions, weight & distance. Second, they have Priority Mail Cubic Rates that are available, which are great for heavier packages going greater distances. Finally, they include $100 of insurance whereas Paypal provides $50. For more info on Pirate Ship and how to use it, check out my post here! Even with Priority Mail Flat Rate Shipping rate increases, flat rate continues to be one of the best ways to ship heavier packages that can fit in the marked packaging. When using these rates, your packaging must always be from USPS, you can order supplies for free here. Below are the increases for Pirate Ship. One way to combat the shipping increases on Priority and ship more cost-efficiently is to use Priority Cubic Rates. I have a full run down of how to use them in my post here, but here are some highlights. The service is available via Pirate Ship. There are no additional fees to set up an account or use. There are size limits, but the weight of your package doesn’t matter (up to 20 lbs). Rates are cheaper for poly mailers than they are for boxes, so if you can fit it in a mailer, that is always your best bet. There are mailers on my Amazon list here that are compliant (there is a small comment box to click on the top right of each item that will tell you what it works for). 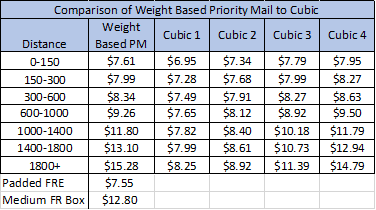 Here is a comparison of the upcoming Priority Mail Cubic Rates to the upcoming Regular Weight Based Priority Mail for a 3 lb package. So What Does This All Mean for Facebook Buy/Sell/Trade? The USPS Rate Increase does mean that those of us who sell in groups will pay more for shipping. For the majority of items, the differences will generally be around 50¢. Since many of us already figure in $3-$4, it’s not a huge change. For larger purchases, there is often a ton of excess shipping built into the total. If someone buys 10 items, and you have estimated $3.50 per item for shipping, you have $35 to cover shipping before giving any discount for combined ship. If you ship using cubic rates, you will never pay more than $15, so there’s plenty of wiggle room. For lower value items, making lots and bundles continues to be the best way to sell and actually walk away with money. If you have 3 pairs of leggings at $9/each, selling them separately you would walk away with about $15. Similarly, you could bundle them together and price at $25, walking away with about $20 — combining shipping really adds up! Check out our Facebook Group for the best kids deals!